On Jan. 10, 2016 David Bowie died of cancer at the age of 69. Though his songs were forbidden in the USSR for many years, Russians found ways to hear his music. And they loved his music. RBTH commemorates some interesting facts that tie the British superstar to Russia. 1) According to producer Tony Visconti, Bowie's album The Next Day was partly inspired by Russia. In an interview with The Guardian Visconti said that Bowie “has been obsessed with medieval English history, which, believe it or not, makes great material for a rock song. And contemporary Russian history, which makes a great rock song”. From station to station. Travels with Bowie 1973-1976, Geoff MacCormack. 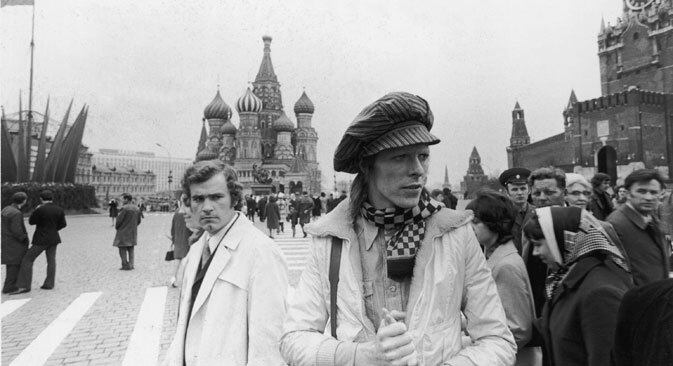 2) David Bowie visited Russia three times. During his first trip April-May 1973, he spent three days in Moscow visiting the May Day parade, GUM and The Kremlin Armory. His next trip was in April of 1976, when he was traveling with U.S. rock star Iggy Pop. On his final trip in 1996 he gave his first - and last - performance in Russia at the Kremlin Palace in Moscow. 3) Gossip about Bowie’s secret trip of 1973 across the USSR from Vladivostok to Moscow seemed too fantastic to be true – as the Far East naval city was closed to foreigners until 1992. However, Vladivostok journalist Ruslan Vakulik managed to confirm the legend, finding evidence from stories published by UPI reporter Robert Musel, who accompanied Bowie on the USSR trip and Bowie’s letters to Cherry Vanilla, his press manager. These documents prove that the musician traveled by train across Russia in the spring of 1973. 4) In 1996 Moscow fans greeted David Bowie when he arrived at the airport with a traditional Russian welcoming ceremony - presenting the singer with bread and salt. Bowie met a different reaction when he performed. According to Russian TV show Programma A, the rock star was disappointed with the cool reaction of the Russian audience and pledged never play in Russia again. 5) Bowie’s music was banned during Soviet times because it was not considered suitable by communist authorities. His songs only became widely known in the 1980s when technological developments allowed for the widespread production of unofficial samizdat - bootleg - copies of his work to be passed among a growing number of Russian fans.